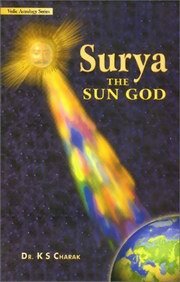 Surya the Sun God is a book that deals with the various aspects of the Sun not confined to astrology and astronomy only. It is an elaborate and multi-dimensional treatment of the Sun. The identity of the Sun with the Universal Soul, and a link between the macrocosm and the microcosm. A connection between the Sun outside and the Fire element that operates within the individual body. Origin of the Sun according to the Puranas. The role of the Sun in the cycle of time, and the concept of the zodiac. Pauranic stories which highlight the various characteristics of the Sun as of special relevance to predictive astrology. The segmentation of the Eternal Time and the cycles of Creation and Dissolution. A complete section on the Sun as appropriate to astrology. The place of the Sun in the yogic discipline; the importance of the Manipura Chakra and the Surya Namaskaara. Propitiation of the Sun as a panacea against ill health and adverse dasha periods of the Sun. This is a book that deals with various aspects of the Sun not confined to astrology & astronomy only. It is an elaborate & multi-dimensional treatment of the Sun. The different aspects of the Sun covered in this book include the following: The identity of the Sun with the Universal Soul & a link between the macrocosm & the microcosm; A connection between the Sun outside & the Fire element that operates within the invidual body; Origin of the Sun according to the Puranas; The role of the Sun in the cycle of time & the concept of the zodiac; Pauranic stories which highlight the various characteristics of the Sun as of special relevance to predictive astrology; The segmentation of the Eternal Time & the cycles of Creation & Dissolution; A complete section on the Sun as appropriate to astrology; The place of the Sun in the yogic discipline; the importance of the Manipura Chakra & the Surya Namaskaara; Propitiation of the Sun as a panacea against ill health & adverse dasha periods of the Sun.